It seems the start of the End of Apple iPhone has begun. After few years of fruit style glory and ripping off the the customers. Our beloved open source Android is going to put an end to it. The signs are very clear, Apple does not introduce its new iPhone based on its custom. seems fruit company has nothing significant to offer so decides to offer nothing. if you don’t play , you won’t lose. iSheeps becomes depressed and speculate the new iPhone will be released in September or October. Apple prefers to stay quiet as always based on its marketing strategy. they try to keep the iSheeps fed and excited. so they can be ripped off later. The anticipated date for releasing iPhone 5 is closing , Steve Jobs steps down as CEO. leaving the fruit company in glory and as a hero. others are to be blamed later. September comes, still no sign of iPhone 5. this phone has become obsolete before its release. its rival Samsung Galaxy S II is equipped with a Dual core 1.2Ghz CPU. at the best scenario iPhone 5 will be equipped with a A5 CPU made by Samsung with a clock of 1Ghz ! yet more to come, Samsung announces its next dual core 1.5Ghz smart phone will be released in next quarter. Apple is almost a year behind now. Google announces the Android based Nexus Prime will be released very soon. Apple is completely knocked out now, unable to compete in the field, sends its legion of lawyers to war. 3 major US operators Sprint, Verizon and AT&T desperate of Apple actions, decide to offer iPhone 5 rival Samsung Galaxy SII. Statistics start to leak from research companies. Apple is not only losing the in field but also loses market share very fast. 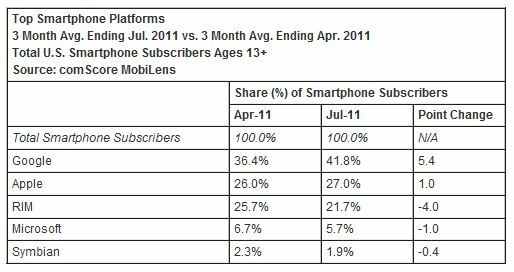 The stats are very clear , by July 2011, Android is dominating the US market share by 42% compared to 27% Apple. the stats should have become worse for Apple by now. If you are an iSheep reading this article , I recommend you to turn on your brain and start using it. The start of The End of iPhone has begun and clock is ticking. Join the wave NOW ! Confess to your Sins and promise you will NEVER ripped off again by fruit company. You will be sent to Android heaven. I declare that I would not trust that doc. I’m regret and i want to apply for that anti fruit wave which you mentioned on your blog. I give you my word that I will never ever let that fruit company to ripoff me again. Long live Pepsi and that anti fruit wave.